Financial Fitness has been defined differently by a lot of different people. 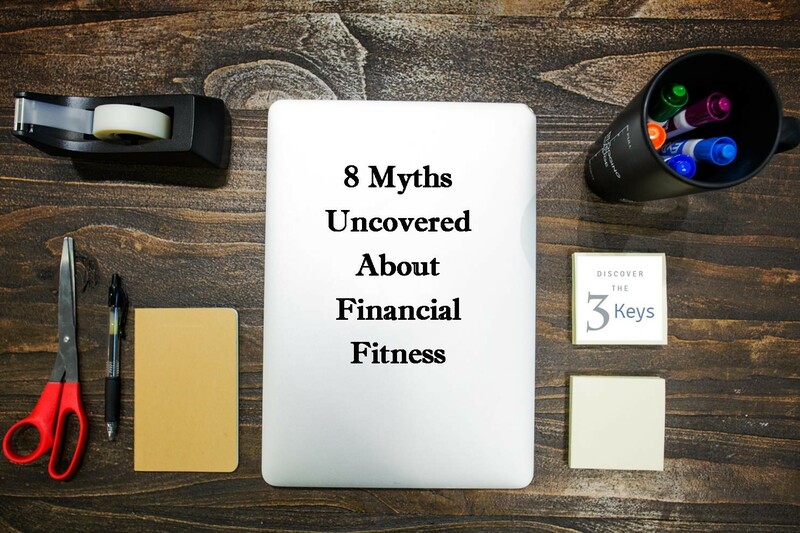 However, through my 10 years of experience developing and creating my Financial Fitness Programs that I work with my clients on, I have uncovered 8 Common Myths that people think creates a Financially Fit strategy or plan. I am here to be a “Myth Buster”. MYTH: Financial fitness is not just an investment strategy alone. Now, an investment strategy that is tailored to your specific needs and risk tolerance is VERY important. But it doesn’t, by itself, create a Financially Fit Strategy. You need to add other factors that round out a comprehensive Wealth Management strategy. Investing is just 1/6th of the puzzle. If you do have an investment strategy, then also be sure that it fits your Risk profile as well. MYTH: Retirement is not a destination, but a journey. If you retire at age 65, odds are in your favor that you can, on average, expect to live until age 84 (it’s actually 84.3 according to the Social Security Administration…but who’s counting!). If you are planning just on a “goal” based mentality—ie. I need to hit $1,000,000 in my retirement account, versus a cash-flow based mentality —ie. I need to maintain enough income to support a $60,000/year expense load—than you may find yourself always chasing and reacting, versus planning for life happening. Cash flow rules…you can adjust to changes easier using this method and you can see your progress with annual updates and planning. MYTH: Yes, your overall Financial Fitness plan should include your family priorities. Yes, your Financial Fitness Plan should be based upon allowing you to refocus your wealth, so you can focus on your family. But as I mentioned above, it is just more than a few pieces. Your Financial Fitness Plan is everything money touches, tied to your overall family priorities and goals, creating a roadmap that you can follow to pursue those goals without having to worry about every bump, change or challenge. A true Financial Fitness Plan is a strategy that should be updated to show your progress and change with your life moments. “Super Duper” (technical term) MYTH: This is probably one of the single biggest myths in regards to planning for the future and your retirement. There are over 500 different combinations that a husband and wife can choose to do. But, Social Security officers do not provide any counseling or consulting on this matter. Congress passed a budget on Friday 10/30/15 which closed some of these strategies, but it is still a major planning priority. Which one is best for you? Well, that is a personal and detailed discussion, which depends on your personal situation. Contact a qualified advanced Financial Planner to help you with that choice. But, be certain that they know and can provide you with factual information. You will need to get a copy of your social security statement. You can contact me for more info if you need help. A true Financial Fitness Strategy will help you go further into how this relates and impacts your future and family. This Can Be True, if you are prepared, but in most cases it is a MYTH: There are viable options that can allow you to do just this, but you need to have the cost of long-term care factored into your overall plan. Remember, my comment above about being goals based versus cash flow? Well, this is one of the biggest reasons that you want to plan using cash flow. It is much easier and more succinct to plan around the need for long term care and for the situations where aging and living at home may not be a viable option. You can go to my website and download a Home Safety Assessment Checklist, or contact me to send it directly to you. This is a good tool to start the conversation with your spouse or with your parents. Gen Xers are becoming more and more aware of the sandwich generation-caring for your parents and kids. This is a potential downfall, but can be planned through with the proper guidance. One of the biggest detriments to any asset base or wealth plan is the need, and rising cost, of long term care concerns. MYTH: This is a huge myth. I can go on and on about this, detailing compounding loss, using after tax dollars to repay something that was deductible before and will be taxed on the distribution in retirement, paying interest on money that was designed to grow…But the worst reason is that did you know….if you leave, quit or get fired from a job where you have an open loan in your 401(k), it will get paid back via a distribution…which is taxable to you in full the year it’s assessed. AND…drumroll…..if you are younger than 59 ½, you will be assessed the 10% early withdrawal penalty on the entire amount that was remaining (as in what you haven’t paid back yet). See the problem. A better strategy to consider could be to stop contributing (albeit, not a great strategy) or better yet….have a qualified financial planner help you create your overall Financial Fitness strategy and plan to get out of—or help you through—the situation you have found yourself. Just a having a will should provide distinct plans for how I want my assets distributed after my death, without problems or stress. MYTH: Now, I know that each state has different intestate rules and guidelines. Also, I am not a practicing attorney so the actual drafting of estate plans is done through a qualified attorney. However, as an advanced financial planner, I have reviewed and worked with a number of estate plans—and issues after a family member passes—to help you through this piece of Financial Fitness (if this isn’t part of your plan, then you need to get a 2nd opinion). There are situations where a will is sufficient, but notice I said without problems or stress. In most states the probate process can be easy and it can be grueling. But mostly, the probate process is contestable. Which means your wishes can be challenged. Quite honestly, all of those pieces may be okay by you. However, if you have minor children, this is where the rubber hits the road. In Illinois, without a succinct and viable estate plan, there are situations where minor children can be viewed by the court different from what you would hope. This then leads to the decision of appointing a guardian…which may or may not be grandma or Auntie so and so who is standing before the judge. This fact, tied with the ones named above, should lead you to want to work with an attorney to see which option is best for you and whether a trust and other estate planning tools should be established, or built into your current plans. Saving for today and tomorrow is really all I need, and then have a good budget. SPEND wisely with a plan. Now, you can see my first Key is Give. That comes from my values-based planning practice where I have implemented education from the Bible and Generational teaching (parents, grandparents, etc). However, even if your beliefs aren’t aligned with mine, this still holds true. Take a look at all the highly successful and affluent figures of our society and past, such as Solomon and Hersey (one of my fav’s), Disney, Rockefeller, Gates. Put aside any philosophical difference and notice a common trend…every time they increased their giving and philanthropy, their impact on society grew as well. They were difference makers. Now, don’t think that I believe in any “prosperity gospel” or think that I am supporting that if you give, then you will receive (to be clear, blessings can be bestowed, but not necessarily monetary gain). But it is a change of heart and it’s a mind shift. When you give to support others first, that forces you to realign your overall view of money. [Money] It is a tool, it shouldn’t be something you have a relationship with. But when you give first, you are forced to plan with the rest. But the act of giving first opens you up to see that whatever you have or what you lot is in life can still be a blessing to others. That is where pure generosity opens your heart and mind. So there you have it. The top 8 Myths Uncovered about Financial Fitness. These were taken from years of working with clients develop their own Financial Fitness Strategy and pursuing their family priorities at the same time. It is possible and living to pursue Financial Fitness is a goal we all should strive for. If you want to learn more, or talk specifically about your situation, please do not hesitate to contact me. The opinions voiced in this material are for general information only and are not intended to provide specific advice or recommendations for any individual, nor intended to be a substitute for specific individualized tax or legal advice. We suggest that you discuss your specific situation with a qualified tax or legal advisor. Securities offered through LPL Financial, Member FINRA/SIPC. Advisory Services offered through HighPoint Advisors Group, LLC. HighPoint Advisors Group and OnPath Financial are separate entities from LPL Financial. David Kujawa is a partner and Financial Consultant with OnPath Financial, LLC, an independent Illinois based firm. David’s focus is to help clients Refocus their Wealth so they can more effectively focus on their family. Over the past 10 years, at his highest value, David has been assisting families and business owners build respected Financial Fitness Strategies. David’s key role is to become the Financial Consultant and Coach providing motivating action alongside each of his clients to pursue their goals. After 5 years of advanced study and preparation, David recently achieved the advanced planning designation of Chartered Financial Consultant (ChFC®). In addition, David recently was awarded the highly sought after Certified Financial Planner (CFP®) designation. These are two of the most advanced designations earned by financial planners and wealth management advisors. Through these certifications, combined with over 10 years experience, David continues to enhance his knowledge and applications of advanced financial planning for both families and business owners. David continues to guide clients with the heart of a teacher. David’s goal is to assist clients see how balance is important and live the 3 Financial Keys in order to maintain and enhance their overall Financial Fitness.